Used them for daughter-in-laws wedding shower. Looked very original, non-standard. Everybody complimented on the decor. I used in for my wedding tables. What girl DOESN'T love diamonds? the kids got them everywhere in the house was the ONLY uh oh. This product is just what we were expecting. It has great color and can't beat it for the price. Would definitely order again. Bought this item for use as table decoration for my daughter's bridal shower. The size is right and the color is gorgeous. Can't wait to use them! These pink sparkly diamonds will be a perfect addition to the tables for the baby shower I am having for my daughter. I will be using these as table decor for a baby shower. I loved the color of the jewels and could not find this color anywhere else!! They are very pretty and very elegant. I am happy it came with so many, however I must not have read the description enough to find out how teeny tiny the jewels are. Im not sure theyll be noticed much as table decor but since there are so many, I'm going to try to make it work. Love Beau Coup, will order again, but have to read the descriptions carefully! We are using this product as decoration for our wedding; we are going to scatter the crystals on the tables to add extra color/sparkle. We got one bag at first to see what they were like, and we loved them so much that we ordered seven more bags! Purchased this product to use as scatter decorations on our wedding tables. It was tough to find companies in the US that offered a product like this, and for a reasonable price. Thank you Beaucoup! Very sparkly and eye catching confetti. Colors are really vibrant and "pop". Should have ordered more! Can't Wait to Decorate with These! These are so cute! Very bright, clear, great size, and plenty of them! They look more expensive than they were, in my opinion. I got the light pink for the baby shower. Perfect! I plan to sprinkle these on the tables for the recepetion, I will say a little will go along way once you have all the other items on the table. I had ordered these to decorate the tables for my wedding. I had a total of 21 10-12 person tables and there was plenty to go around. At first when I got the package I thought "oh no these are too small I would have to use a ton per table to fill up space." However, when you take into account the floral centerpieces, glassware, plates etc I had more than enough!!! With candles scattered around the centerpieces the light bounced off and it really looked suttle but added just enough to my fall themed wedding! The "Gems" are very pretty, but the bag containing the "Gems" is not sturdy, and most of the nuggets had spilled out of the package and was all over the box. very pleased with everything from looking on website to purchase to shipping time. PERFECT COLOR AND SIZE ! These are the perfect color and size I was looking for for my daugher's wedding. They will look great on each of the tables with the mirrors along with the lit votive candles and her centerpieces. I can't wait to use them. Rehearsal dinner colors black and white - bought both black and clear 'diamonds' to sprinkle on the table for some 'pop'. Great idea! I used these for the tabletops at a baby shower. They added so much. They were just the right size, color and sparkle that I needed to complete the tables. This product seems fits perfect to the theme of my wedding. I loved them when they arrived. I should have ordered more. You will love love love this product!!! These will be used for table decorations, I love the fuschia color along with the black can't get any better than this. Perfect accent 2 the wedding! I put this in my tables for decoration to bring out the tablecloth and center pieces..
Give your table that "extra" touch! We are sprinkling clear and black crystals on the tables at the wedding. They also look great in clear glass flower bowls. THe perfect touch for the ending result of our centerpieces.! I can't believe how much more "wow" it gives to the centerpieces. We just scattered them around the centerpiece and it looked awesome!! I love this diamont confetti - awesome! The diamond confetti is just perfect in size and the perfect colors for our wedding theme. Love it! Using to decorate receiption tables. Excellent product for the extra touch. I LOVE the size. I am also ordering the crystal tea lights to co-ordinate on the tables. I will mix the crystal (clear) and light aqua to tie in the colors with the other "table accents" (I also ordered the coaster picture frames). 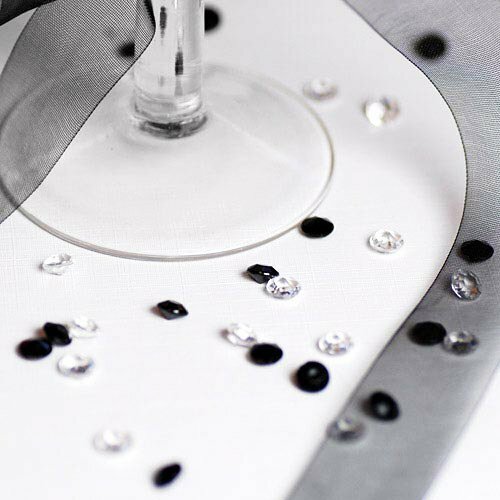 The two color "diamonds" will stand out on the white table cloths. I ordered one bag of each color for 5 tables but at this value I am going to order one more bag of each color. I will always have a use for them! Love them. Simple yet perfect. They were cheap and you get a good amount for your money. Very happy with the purchase. Placed on white tableclothes and really stood out! Great little sparkles to add color and ambiance to any setting. I can't wait to use them at my reception! The diamond confetti is beautiful. I am going to scatter on the tables at my wedding reception. "I would buy these again"
ADD TO VASES, ATTACH TO INVITATIONS AND THANK YOU NOTES. We are going to use these beautiful diamonds on the food table and the gift table and all of the other tables. We are going to scatter them on the tables add votive candles and orchids and our tables are going to be beautiful! We used the diamond confetti at the bridesmaid's luncheon. We had tall diamond tea lite candle holders in three heights on silver stands located on square mirrors with small tea lite diamond candle holders sitting flat on the mirror. We tossed a hand full of the confetti on the mirrors and let it overflow onto the table. It was just a great finishing touch on the centerpieces for the tables. We also had diamond engagement rings to use as napkin rings. Good product, a tad expensive for the amount recieved. THESE ARE GREAT, DOESN'T LOOK CHEAP AND PLASTIC... GORGEOUS. Used it as confetti very elegant. Crystals doesn't look like cheap yet affordable price. But i thought 1000pcs are enough. Seems lot but its not. Next time will order more. for some reason, i thought this confetti would be bigger in size. The diamonds are very small.. and 1000 may sound like a lot- but it isn't. They are pretty though- don't get me wrong!! just order more than you think you need. These are very pretty little extras to have at the reception, but like another review said from what the picture looked like I thought they would be bigger, so order extra. The colours are great! i sprinkled these on my tables to add a little more sparkle to the reception . The confetti was a perfect accessory to our table decoration. Love the value, much better pricing than local craft stores and better color selection! Q:does black and clear mix in one bag of 2000? or is it just clear? Q:Do you still sell the fuschia? I'd also like purple too... All I see available is aqua and clear. A:Unfortunately, these are only sold in clear and aqua for the time being. Can you tell me how many cups will 2000 pieces fill? As in the cooking measurement of a cup? I plan to fill small candle holders with them. A:Each bag of confetti fills 1 measuring cup. A:We recommend 3-4 bags for 24 tables. 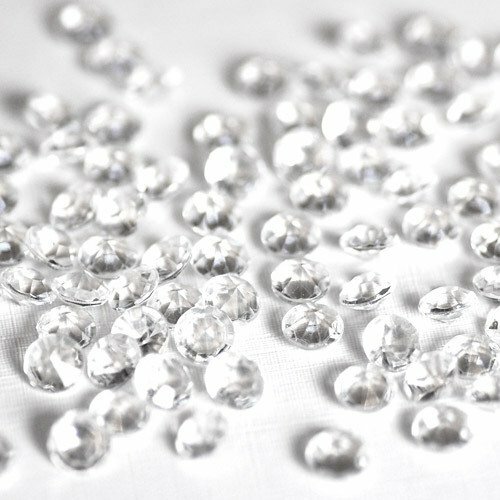 If you love bling, diamond confetti is just the thing for any event! These sparkly gems are simply gorgeous when used as table decorations sprinkled on tabletops or when used as wedding decorations piled in crystal vases. Whatever the occasion, these delightful diamonds are popular party decorations. Diamond confetti comes in an array of colors that you can mix and match to your heart's content. Choose from a variety of colors, these unique party supplies are made of durable, crystal-clear acrylic. Each bag contains approximately 2,000 1-carat size sparkling acrylic diamonds. Want to add more shimmer to your wedding supplies? These diamond-like favors are fabulous favorites: diamond ring keychains, diamond ring napkin rings and diamond ring wine stoppers.